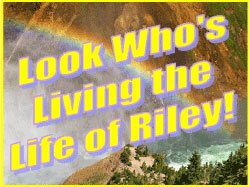 *** WINNERS *** Nicole, Terri, Bunny, Sara and Lynn are Living the Life of Riley! CONGRATULATIONS! *** WINNERS *** Tanya, Kathy, Alexia, Chrissy and Margaret are Living the Life of Riley! CONGRATULATIONS! *** WINNERS *** Valerie, Melissa, Sarah and Amy are Living the Life of Riley! CONGRATULATIONS! *** WINNERS *** Carrie, Teresa, Stony and Bridget are Living the Life of Riley! CONGRATULATIONS!